When confronted by God about his sin in the Garden, Adam quickly shifts the blame to his wife. But if we look closer, we see that while Adam says that Eve gave him the forbidden fruit, he actually places the blame on God for giving the woman to him in the first place. Adam is, in effect, saying, “If You hadn’t put her here, God, this never would’ve happened.” It sounds like that forbidden fruit contained a seed of bitterness, as well. Do any of those sound familiar? They certainly do to me. How often do we subtly—and not so subtly—accuse God in our misfortunes or when, like Adam, we’re trying to justify our own wrongdoings? Interestingly, we never again read an utterance from Adam throughout the entirety of Scripture. We do hear from Eve, though. Twice, in fact, as she credits God for the births of her sons Cain and, later, Seth. Eve could have focused on the sorrow and pain of childbirth, which God had said He would “greatly multiply” to her (Genesis 3:16, NKJV). How easy it would have been, how natural, for her to be angry with God for causing her that pain. But Eve had been deceived before. She wouldn’t be deceived again—not this time. The serpent had convinced her to take her eyes off the goodness of God once, to dire results. This time, God’s goodness would be foremost in her thoughts and fast to fall from her lips. Consider that Adam’s firstborn son, Cain, also became “a tiller of the ground” (Genesis 4:2, NKJV). Literally following in his father’s footsteps, I can imagine a young Cain toddling about the fields, mimicking Adam as he worked, helping to dig holes and plant seeds. Soaking in all his father had to teach him, surely the boy wanted to grow up to be just like Dad. Tragically, we remember Cain today as a murderer, having shed the blood of his righteous younger brother, Abel (Genesis 4:8, Hebrews 11:4, NKJV). How could the eager young lad of our imaginings become the cold-blooded killer of Genesis 4? 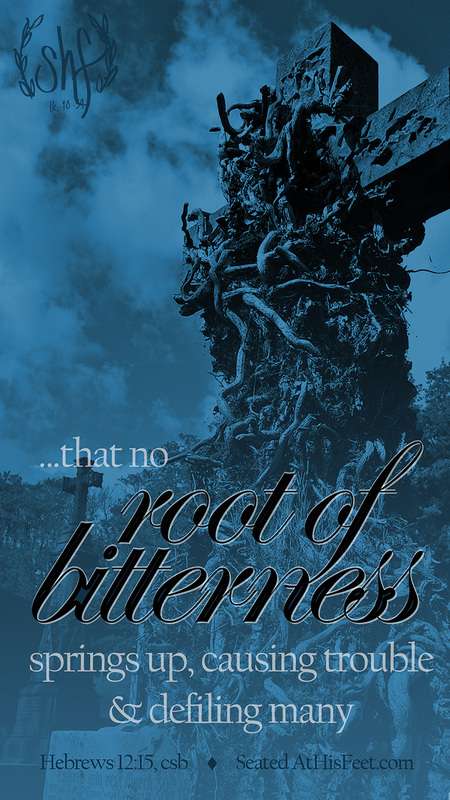 Hebrews 12:15 warns that when we allow a root of bitterness to spring up in our lives, it not only causes trouble for us but also defiles many others. I think that, quite possibly, Adam’s bitterness toward his heavenly Father infected his earthly son. What words of offense toward God might Adam have spoken in front of his impressionable son? Did Adam’s embittered actions toward his wife, or toward the son whose offering pleased the Lord, reveal resentment over his own broken relationship with the Father? Did his attitude toward work express dissatisfaction with the call God had placed on his life? There’s no question that offenses will come our way. Jesus Himself told us to expect them (Luke 17:1, HCSB). They’ll come creeping up on us unexpectedly, be hurled right in our faces and get dropped directly in our paths. But when offenses land at our feet, we have to make a choice. Will we respond in kind…or with kindness? We can forgive the offender, bless those who curse us (Luke 6:28, NIV) and keep moving forward with Christ. Or, we can stoop down, dredge that offense out of the mire, and let the muck splatter all over us. Anyone who’s ventured outside after a rainstorm knows it’s far easier to stay clean by avoiding mud in the first place than to spend the rest of the day cleaning it off yourself, not to mention dealing with the mess you’ve tracked all around you. The same goes for our hearts and lives. We can only speculate about what was in Adam’s heart as he exited Eden. But, by God’s grace and the Spirit’s power, we can guard our own hearts against bitterness. Today, let us consider our words, actions and attitudes. What do they communicate to God, to those around us, and to those under our influence? May we exchange accusation and offense toward God with thankfulness and praise for Him, that any hint of bitterness might die on the vine.